This Wilkinson design example was provided by Kjer Andresen, who designed it as part of his part of his Diploma Thesis, auf Deutschland. He used calculations he found here on Microwaves101; this is exactly how Microwaves101 is supposed to work, you stop here, get smarter, and then contribute more content so the rest of us get smarter too. Kjer gets it, do you? 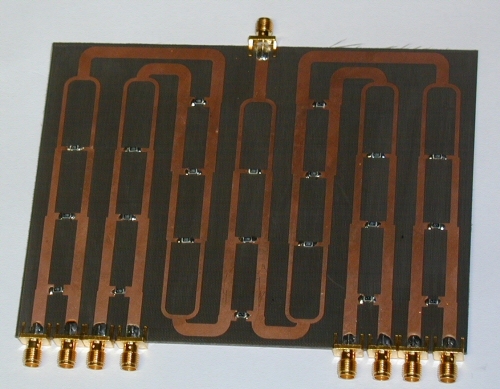 This 50-Ohm combiner (shown below) was developed on Duroid 5870 and Ultralam 2000 (both Rogers products). Kjer used Agilent's Advanced Design System (ADS) to design the splitter, and a Rhode & Schwartz network analyzer to verify the design. Say, that smells like free advertising, enjoy it while it lasts, microwave cheapskates! 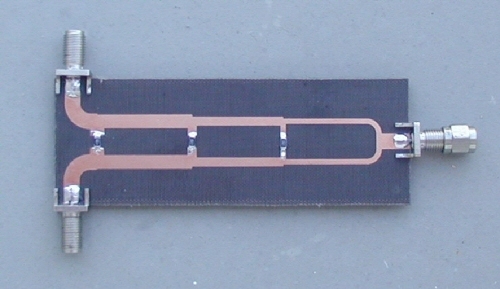 This is a good example of a microstrip, N-way, multi-section Wilkinson design with equal amplitude outputs. 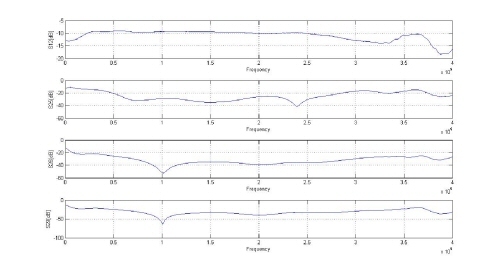 Ideally the outputs are 9 dB below the input signal due to the cascade of three 3-dB splits. Such a cascade of two-way splitters to achieve 2N outputs is called a corporate splitter. 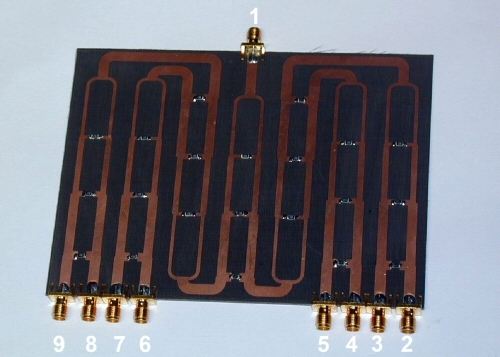 I've been working on a Wilkinson combiner project for my diploma thesis at the Institute of Measurement Technology at the Technical University of Hamburg for about two months and found a lot of helpful information on Microwaves101. Now I want to share my results with you. First I looked at the other examples at Microwaves101 and simulated them myself with the Advanced Design System by Agilent. Gradually I changed some parameters so that they fitted my constraints. You will need to double these impedance values, because there are two arms (transformers) in parallel. Next I set the three isolation resistors to 300 Ohms and made them tunable in ADS. I also tried to exercise the optimization function of ADS, but the solutions were extremely different from calculation to another, so I decided to tune the resistor values by hand. Nice to know: when you set up your ADS simulation with variables you can tune them and watch the S-parameters change. I used this for optimization of the resistors as well as the center frequency. For example, set L1=L2=L3 and move the slider to change the value, you will see how the center frequency moves left or right. 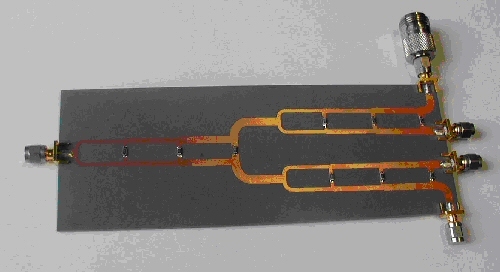 Here is a picture of a four-to-one combiner I developed by cascading two stages of the two-way splitter i developed. All of the important paths have the same physical lengths and it works very nice with my goals. I needed to place two connectors on the long side which disturbs the equal path lengths somewhat, because of the big N-connectors of our network analyzer. If you need phase matched outputs you'll need to make all paths have the same physical length. Now I cascaded three stages of two-way/three-section combiners to get my eight-way combiner, shown below with the port numbers labeled for discussion. What did I expect to get? 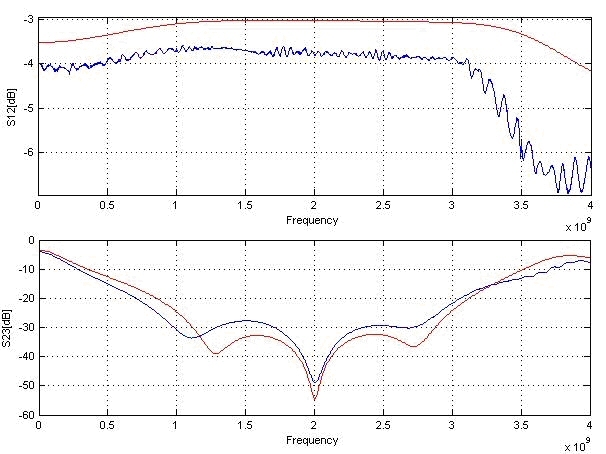 S12, S13 ... S19 parameters should all ideally be close to -9 dB, because the signal goes through three -3 dB combiner losses. The isolation is not the same between all outputs, because there may be different numbers of combiners between them. For example: ports 2 and 3 are neighbors and connected to that same combiner, so expect -20 dB isolation. But between ports 2 and 5 is an additional combiner, which adds -20 dB, so we can achieve -40 dB isolation for S25. OK, the splitter's response looks nice, but the S12 parameter degrades above 2.5 GHz. This may be because the 50 ohm strips between the second and third stages of the cascade don't have the same length (which also means that the split ports won't be phase matched). This is an artifact of of the compact design layout I chose, which I might fix in later developments. But if you can live with it the eight-way combiner stays a lot smaller. There may be more going on here that could explain the "extra" loss above 2.5 GHz. Looking at the mismatch loss (S11, S22, S33, etc.) will give some hints, it might be that the connectors are not grounded properly, sometimes they are sensitive to not having via grounds underneath the tangs that are soldered to the top of the board (but then again, this is relatively low frequency for this problem to rear its ugly head). Also, the close proximity of the paths after the second split could cause some stray coupling. But all in all, we say job well done, and wish Kjer all the best in his pursuit of microwave excellence in the future!